We are approaching the end of winter … right? 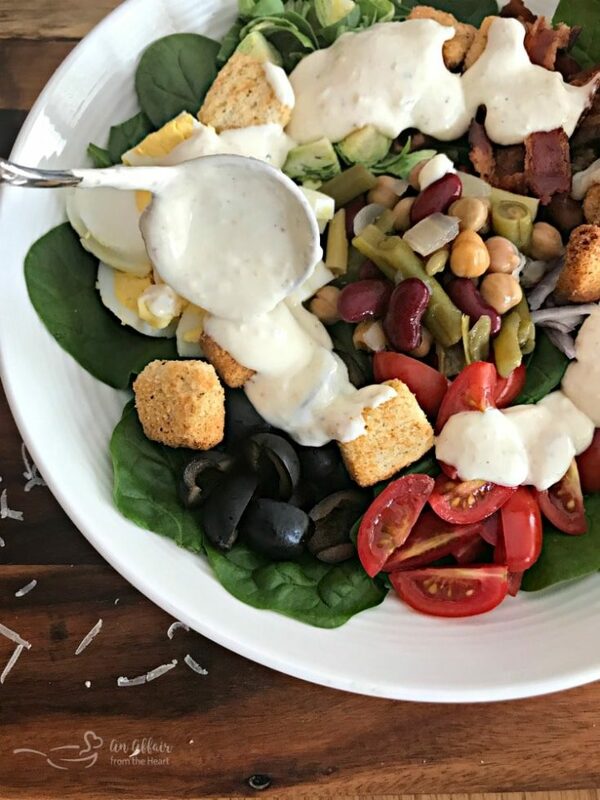 (please say that’s right) If you are starting to think about swimsuit season, and I am sure that many of you are, it’s time for more salads and lighter fare. This salad is full of hearty veggies and topped with a delicious homemade dressing that will keep you feeling satisfied. We eat a lot of salads. But, I will be honest. I get bored easily, and eating the same ‘ol thing all of the time just doesn’t really go over well with me. So, different toppings, different types of lettuces and clever dressings are all instrumental in keeping this salad loving girl a happy one. I always keep a couple of jars of Paisley Farm Bean Salad in my pantry. It’s easy to open a jar up to use as a quick and delicious side to meals, as an ingredient within them, or as a topping on a salad, like I am today. 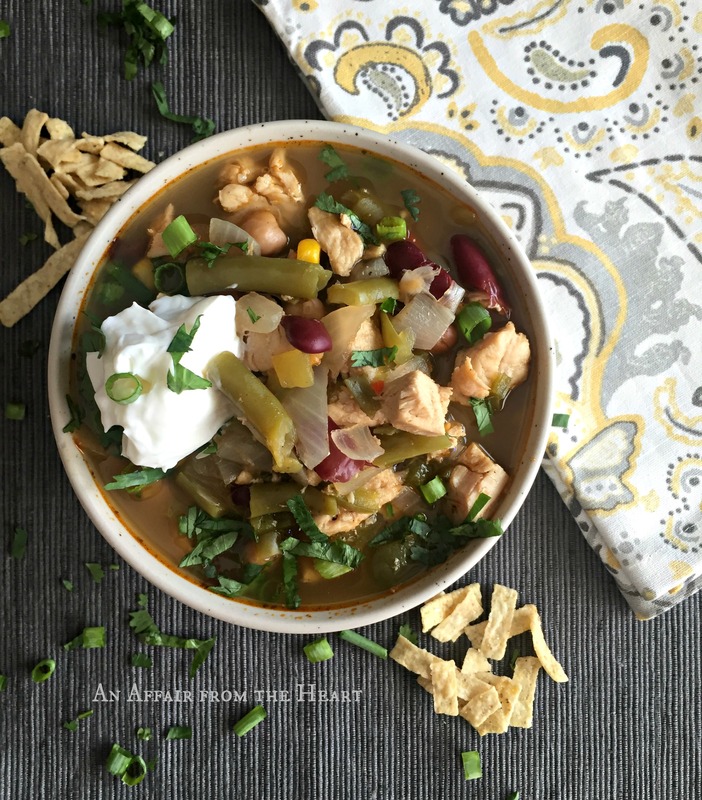 Use bean salads in soups, stews and chilis, like this FIVE BEAN CHICKEN CHILI – This chicken chili has a sweet heat that will keep you coming back for more! Full of nutritious flavorful beans. 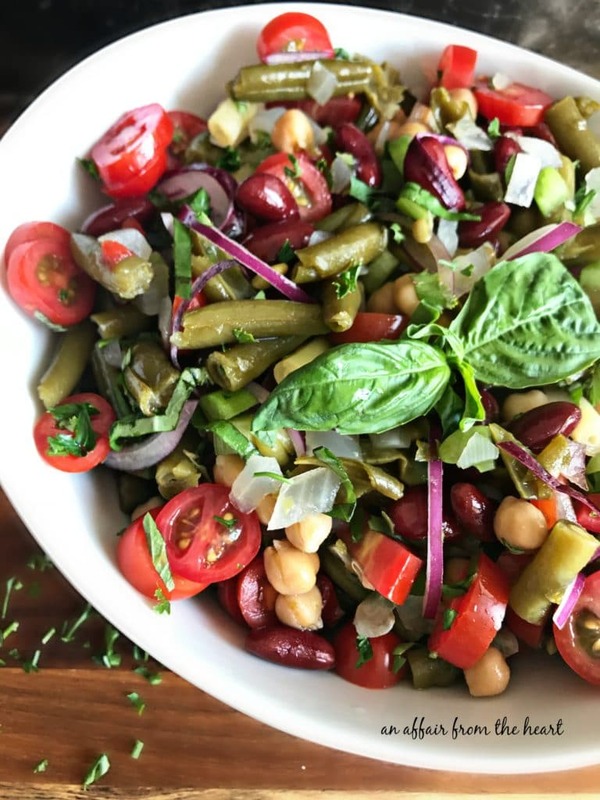 Add some fresh herbs and veggies to make a fun twist like in this super popular ITALIAN BEAN SALAD — Four bean salad gets an Italian makeover with the simple addition of some fresh herbs, veggies and tomatoes. 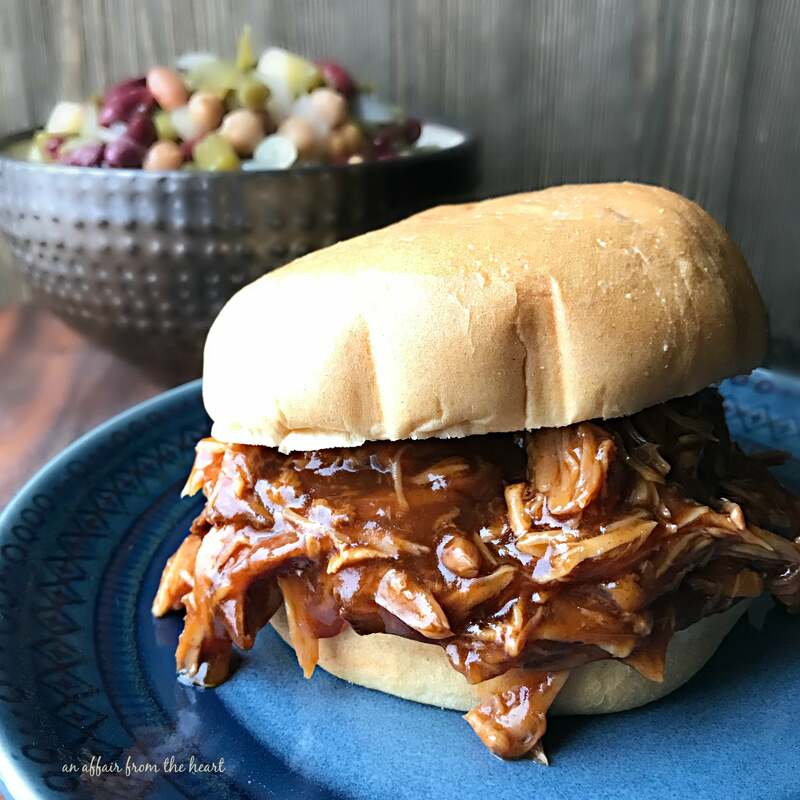 Use them as a quick and easy side right out of the jar – we love them with BBQ at our house especially with these DR. PEPPER BBQ PORK SANDWICHES — Make these mouthwatering BBQ Pork Sandwiches right in your crock pot. Pork loin roast, slow cooked all day, making it’s very own Dr. Pepper BBQ Sauce. Make sure you grab a napkin! If you have never made homemade dressing, I urge you to change that. There is nothing on a shelf that is going to compare with what a few ingredients and a little extra time can do to make your own homemade dressing. In this particular dressing, one extra step, roasting the garlic, puts the flavor right over the top. Sure, you can make it without, but trust me, the roasting? EASY and so worth it. 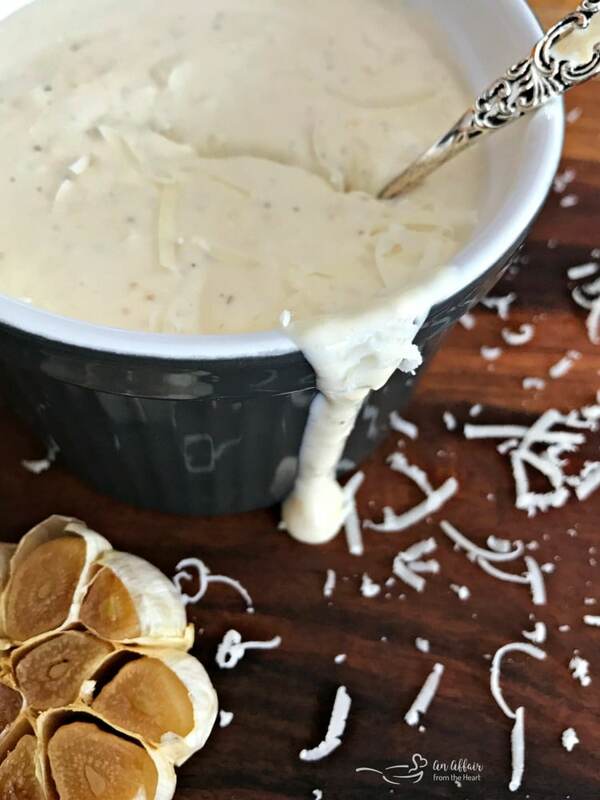 This Creamy Roasted Garlic Dressing, comes together super fast, roast the garlic in your oven, it’ll get combined with some Pecorino Romano cheese, some fresh lemon juice, some mayonnaise, cream and some salt and pepper. 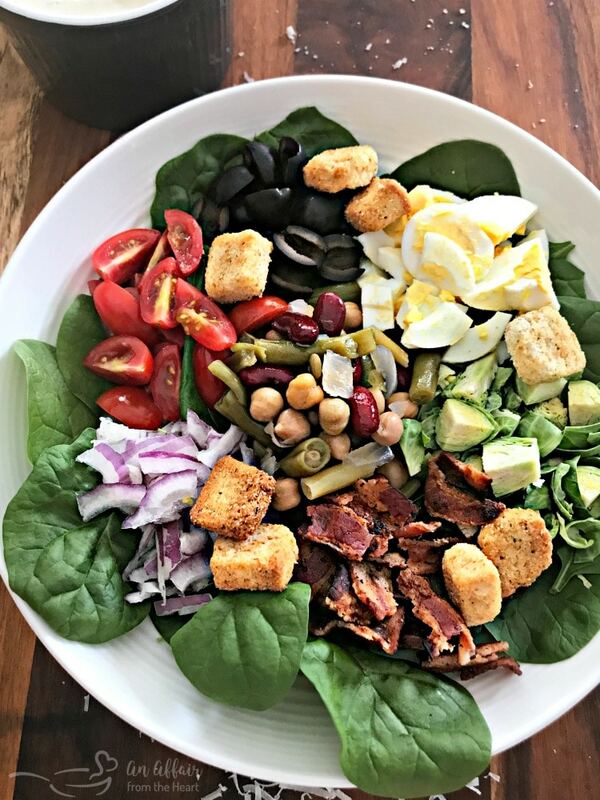 For the salad … baby spinach leaves, Paisley Farm Four Bean Salad, prepared thick sliced bacon, hard boiled eggs, red onion, tomatoes, black olives, brussels sprouts and croutons. 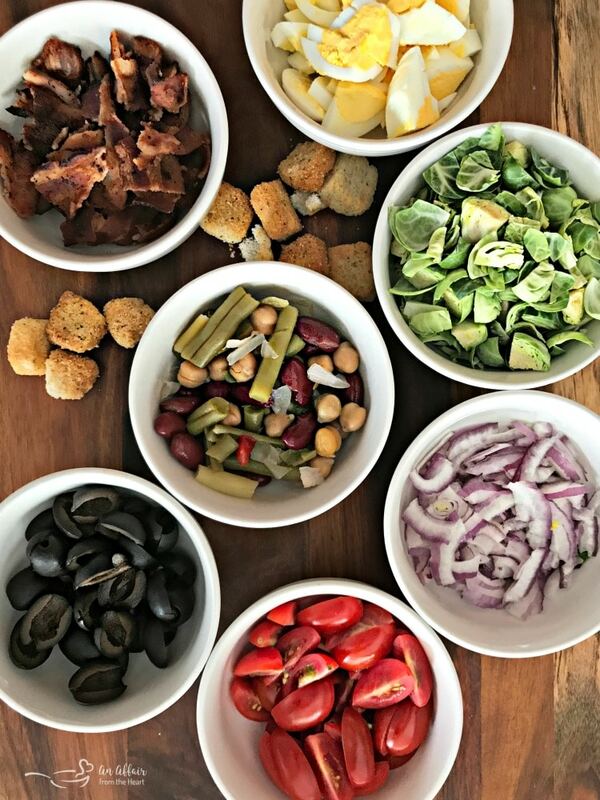 Of course .. you can switch up the veggies to your liking, but if you are wanting something tried and true — follow along here for what I found to be salad perfection. Start by adding a couple of handfuls of baby spinach leaves to a plate. Top with all of the ingredients, add your dressing and give it a toss. We always add a nice sprinkling of fresh cracked black pepper, too. Have you tried Paisley Farm Four Bean Salad? It’s all natural and can be served anytime. From family picnics, to elegant meals, or just snacking straight out of the jar, you can’t go wrong with this salad. 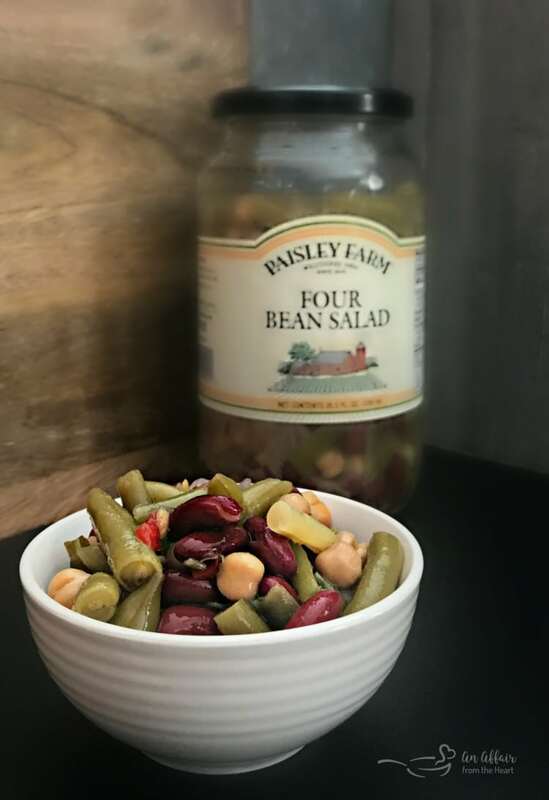 Paisley Farm Four Bean Salad is a sweet blend of kidney, garbanzo, green and wax beans accented with freshly diced onions and red peppers to give it even more flavor. Prepare dressing by combining all of the ingredients in a large wide mouth mason jar. Blend together using a stick blender. Place lid on dressing and refrigerate until ready to use. Place two handfuls of spinach leaves on each dinner plate. Top with other ingredients, using half of each for each salad. Top with dressing to your liking, and toss. Dressing keeps in fridge for a week. For more great recipes and products from Paisley Farm, visit their website and follow them on FaceBook, Instagram and Pinterest. I love a loaded salad, especially when it has a homemade creamy dressing. This sounds delish! That garlicy dressing sounds creamy and delicious. I love having healthy salad ingredients around the house to whip up yummy dinners like this one. That bean salad looks good too! It’s delicious!! I always keep some on hand! This is my kind of eating. Love all the different flavors & textures going on with this salad and that dressing sounds amazing. Can’t wait to try this. I sure hope that you enjoy it, too!! Sometimes all you need is a hearty salad for dinner and this one is sure to hit the spot. 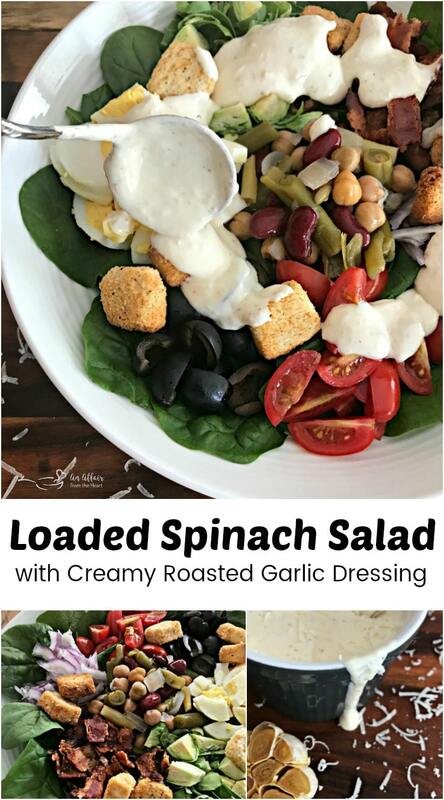 Love the creamy garlic dressing! I am all about salads like this! So much goodness. That dressing looks to die for! This salad looks absolutely amazing!! It is loaded with so many yummy veggies!! I can’t wait to give it a try!! Thanks, Jane!! I hope you love it!! What a delicious and filling salad! Perfect for a quick lunch or dinner. I love the addition of the four bean salad and the dressing sounds incredible. I love garlic! This salad looks and sounds so delicious and perfect for a healthy dinner! Can’t wait to try the dressing – that’s just what I love! Ummm that dressing!!! I would put it on everything! This salad looks delicious! I am loving the dressing! I could eat that dressing on anything! It’s great as a veggie dip, too! I’m with you, I love salads but get bored easily. I could eat this salad with that amazing dressing every day. I grew up eating a bean salad like that and it would be delicious with that beauty of a BBQ Pulled Pork sandwich! Bean Salad with Bacon. Yum! A hearty salad for dinner. Wow… This sounds really good! What a beautiful combination of colors and flavors! OMGoodness! I love everything about this salad and the dressing! Oh my! So many great things in this salad… and the dressing? made it all come together just perfectly! Makes me want to eat salad everyday! I love a good homemade dressing and this roasted garlic dressing is to die for! 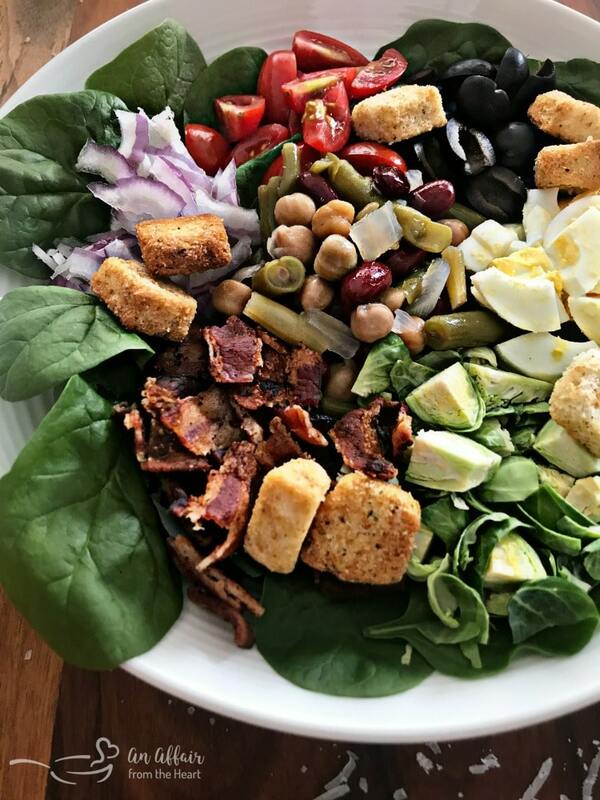 I love three bean salad but adding it to this spinach salad is genius! I love a big, colorful salad – especially one that’s topped with a delicious homemade dressing!! This Loaded Spinach Salad checks all the boxes on our salad-loving list! It even includes my favorite Paisley Farm Foods Four Bean Salad! Yum! So happy you love it like we do! What an incredible salad! I love the combination of flavors!